It goes without saying that Microsoft has had a tough time of it this generation - the kind of tough time that leads inevitably to a certain kind of commentary where each bit of positive news is placed under the microscope to see if this time, finally, it might be the long-awaited sign that things are "turning a corner" for the embattled platform. This kind of discussion hovered around the PS3 in the last few years of the past generation; it was conspicuous by its absence from the ill-fated Wii U, which nobody ever really expected to turn a corner, or indeed to do any manoeuvring that didn't involve running into a wall. Lately, it's the turn of Xbox; after a woeful start to the generation and a couple of years coughing on the dust kicked up by PS4 as it raced ahead, Xbox now seems to have made enough solid, good moves for people to start thinking in corner-turning terms. "The resuscitation of the Xbox brand will come as the result of many, many positive decisions and morsels of good news, not as a single turning point"
Console platforms don't turn corners, though - not in the snappy sense that phrase conjures. Console platforms are like giant seafaring tankers; they don't spin on a dime, they ponderously and carefully change course, manoeuvres that must be carefully plotted and which take a very long time to execute. The resuscitation of the Xbox brand will come as the result of many, many positive decisions and morsels of good news, not as a single turning point - and progress to that end needs to be measured as a summation of a host of things about the platform, not assumed from a single hit title or high-profile studio signing. Where, then, does Xbox stand right now - as we reach the point in the generation where companies actually start to talk openly about plans for future hardware, as Sony did this week? Well, a fair assessment of everything that's happened of late would conclude that Microsoft seems to actually be succeeding in turning the tanker around. 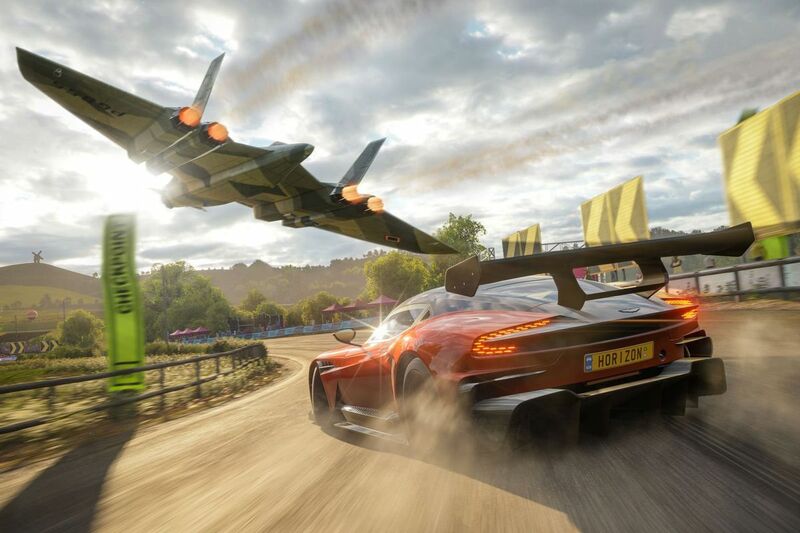 In this week's news alone we saw great performance for Forza Horizon this week, reports that hugely respected studio Obsidian might be added to the already impressive line-up of first party developers announced earlier in the year, and updates to a few more slow-burning stories like the very solid expansion of the back-compatible library that's been happening for quite some time now. The Xbox brand, if not the console itself, feels like it's finally starting to pick up a little momentum. This isn't to say that Sony needs to be looking over its shoulder just yet. It's probably too late for Xbox One in its current incarnations; this isn't going to be like the last generation, where a hell of a lot of hard work (and a not insignificant consumption of humble pie) from Sony finally knocked the PS3 into decent enough shape to challenge Xbox 360's installed base by the end of the generation. PS4's lead is simply too enormous at this stage to be realistically challenged. "Microsoft needs to find the 'Xbox difference' and promote the hell out of it - not just to 'rescue' the current generation, but to build a solid and lasting foundation for the years to come"
Besides, some of what Microsoft is doing in terms of streaming services and platform fragmentation makes direct comparisons to the monolithic PS4 platform a little tricky now - even if they were actually publishing figures, which they dropped in favour of cryptic statements about sales success that read more like clues to a frustrating puzzle in an adventure game than actual business updates. The fact that Xbox One doesn't have a realistic prospect of catching or overtaking PS4, however, doesn't make what Microsoft does with the next year or two of Xbox any less important. On the contrary, the time between now and the next generation launching will be absolutely crucial for the future prospects of Xbox, for exactly the same reason that Sony had to work so hard to change perceptions of PS3 rather than just going "oops, screwed the pooch on that one, let's try again later I guess". The PS4 couldn't have flown out the door if the PS3 hadn't done such a solid job of winning back consumer trust and faith among core early adopters; to many people it will always be the ill-judged and disappointing console that fell between the massive successes of PS2 and PS4, but by the end of the generation the perception of the overpriced system and the blowhard rhetoric Sony had cloaked it in had largely been replaced by solid respect for a good software line-up, vastly improved operating system and public communications that were so much better as to be unrecognisable as coming from the same company. Whatever Microsoft does next with Xbox - new hardware entirely, a continuation of the Xbox One family, a pivot to streaming from Azure or a mixture of the above - will rely heavily on pulling off a similar trick. Despite the undeniable prowess of the Xbox One X, it launched quite softly precisely because the One hadn't clawed back reputation and support yet; whatever comes next needs a stronger foundation to build upon. The games themselves, of course, are fundamental to this. The development studios being brought on board are incredibly promising and undoubtedly make many people excited for the future of Xbox in a way they likely haven't been for quite a few years - but they won't make a real impact on what's actually playable on Xbox for a year or two at least. As a result, the current lineup has to be executed upon damn near perfectly in the interim, which makes the great performance of the new Forza title into very positive news for Xbox overall. The system isn't going to get a whole lot of big exclusives in the coming years, and it needs to make each one count. Building up such a solid library of back catalogue titles really helps to tip people in favour of the platform; it's easy to overplay the importance of backwards compatibility to consumers, but building up this service gives Xbox One something its competition can't offer. It's the performance of cross-platform titles that's going to be really crucial, though; games like this week's Call of Duty and last week's Assassin's Creed are a chance for Xbox to make back ground, inch by inch, by pushing the platform as being the best place to play these huge tentpole games. The problem for Microsoft is that this is a much harder task in this generation; the Xbox 360 successfully marked itself out as the best place to play cross-platform titles for a lot of people, but that owed a great deal to weaknesses of the PS3 (in terms of network services more than anything else) which have not been replicated on the PS4. In contrast, PS4 does a very good job of pretty much all the basics, and Microsoft struggles to find points of differentiation; "Xbox One X can push a few more textured triangles out" just isn't good enough, because for most consumers the specification differences between the systems aren't very noticeable or important. This is the real task ahead for Xbox. The tanker is turning and Microsoft is genuinely starting to win back hearts and minds with good, solid execution around its platform - but it still lacks a kind of "Xbox difference" that would make people think this console is something they need under their TV, most likely nestled alongside an existing PS4 or a Switch. There needs to be something you can do on Xbox that PS4 can't do, or isn't good at. We've seen hints at what that could be, given a chance - the play-anywhere technology and ethos Microsoft are developing is a promising candidate, especially given that Sony's efforts at extending PlayStation functionality to additional screens (either Vita itself or smartphones and tablets) have largely been unimpressive. Perhaps there's something else in the labs we haven't even seen yet which will ultimately become the "Xbox difference". Whatever it is, Microsoft needs to find it and promote the hell out of it, not just to "rescue" the current generation, but to build a solid and lasting foundation for its games business in the years to come. "The system isn't going to get a whole lot of big exclusives in the coming years, and it needs to make each one count. " Did I miss the bit where the Xbox One actually got a whole lot of big exclusives? Whilst I agree with the articles sentiment, I think Microsoft really made a monumental mistake selling off its best game studios. It don't matter now what new studios it signs up because game lead times are so long. So when you say platforms are more like tankers, the Xbox One tanker must be an absolute behemoth with an exceptional turning circle. The ship has actually turned already and its heading away from the industry. Why would you write an uninformed article like this? ALL Xbox games are on PC. They could release 20 AAA's per year. You don't need Xbox. They purchased AA studios and two already made games for them. They lost Pressplay, Remedy and Lionhead from this gen so they're in the same exact position as the start of the gen. Sales are in the gutter. Being outside almost 4 to 1 worldwide. Xbox doesn't sell worldwide. They have nothing in the works for 2 years besides Gears that's past it's prime. The Xbox tanker is turning! Right onto the PC, Switch, PS4 app.